The hotel room smelled like the dying hulker in the grass. It did not make sense to Mhumhi. Out there in the waving golden stalks and leafless trees that had seemed so foreign to him, where there was dirt instead of concrete underneath his paws, the image of the painted dogs tearing the man into pieces had seemed to somehow be allowed. But in here, where there was soft white carpet and a bed and a tiny kitchen and a window with a balcony, the blood and the smell and the terror of it all did not fit. Kutta was the first to step into the room, almost hesitantly, using her muzzle to lightly push the door open. As she did, something rattled. Mhumhi looked up and saw a small broken chain swinging near the top. Blood had seeped into the red carpet, soaking the fibers in some places, so that the trails looked almost like intentional designs. The sheets on the bed were rumbled and folded back, and more blood lay on the sheets, a tiny pool of it collecting into a soaked hollow where something had lain. Aside from that, the room seemed undisturbed. A large television sat on a dark wooden counter with a tray and cups lying beside it. A, unopened bottle of something dark and sour-smelling sat in an empty plastic bucket. The sliding glass door leading out to the balcony was open a crack, and a breeze was gently stirring the long fur on Mini’s back. Again Kutta was the first to step forward, hesitantly lowering her head to sniff at the nearest blood on the carpet. She gave a thin whine. Don’t say it, Mhumhi begged her silently. She moved forward, head scanning from side to side, and then jumped up on the bed, circling around the bloody indentation. At last she thrust her nose forward and took a single lap of the blood. Mhumhi said nothing, because he was still wishing that she would be quiet about it. He had not moved further than the threshold of the room, standing stock still half-in and half-out of it. Vimbo’s large, coarse form pushed past him as the hyena lowered his head to sniff as well. Mhumhi wondered what he felt. Did he have a sense of what they were upset about? Did he care? Was he merely going along with it as a means of staying in the group? Kutta jumped back down from the bed and went to the kitchenette, her claws ticking as the floor changed from carpet to tile. “Mhumhi, help us,” she implored, looking back at him. She was starting to pant hard, a rapid cycling of breath that made fluid drip from her tongue. He averted his eyes from her yellow gaze. Mini walked underneath of him to stand beside Vimbo. She said something in the hulker tongue, and he looked at her. Kutta had moved from the kitchen, her erratic circling and sniffing becoming increasingly more frantic. She shoved between Mini and Vimbo and through the cracked-open door behind the kitchenette, vanishing from their sight. Then she gave an awful howl. That was Mini, who had come back out of the room to yap at him. He stopped running and looked back over his shoulder at her. Mhumhi said nothing. He had found that a peculiar numbness had gripped his jaws and tongue, so that he could not speak, but he could glare at her, hating her. Mini stopped, perhaps reading his expression, though it was hard to tell with her body language masked by all that fur. Her tone of voice was strangely neutral. Mhumhi gave a soft growl at this. Mhumhi’s jaw seemed to unlock a little, and he swallowed dryness. Mhumhi stood with his knees stiff for a moment, then turned and walked towards her. He felt as though the hall behind him were being sucked away, so that at every moment his back feet were standing on a terrible precipice, with each step losing him another inch of safety. He went back into the room and into the kitchenette, claws clicking. Vimbo was there, lowering his head to grunt, looking into the bathroom. Kutta’s red back was visible in the yellowish light- she must have flipped the switch. Mhumhi went to stand beside her, looking all around- there was little of the smell of blood here, and only a few flecks on the tiled floor, none on the toilet or the sink. Kutta was standing with her forepaws hooked over the side of the bathtub, looking inside. Mhumhi’s tail had gone completely up underneath his belly now. He could smell the body. He went and raised himself up beside her, claws slipping on the smooth porcelain, and looked down. Inside lay the body of a large male painted dog, head and shoulders smashed almost beyond recognition. It looked stiff, and the blood on the fur was dried. “I don’t understand,” said Kutta, and Mhumhi found he agreed with her. He did not understand. But he did feel a profound sense of relief. “They aren’t here,” he said. It felt like his insides were unclenching. Kutta looked at him, then got down from the bathtub and back onto all fours. Mhumhi did not like the part she didn’t say. Because they have lost so much blood. Kutta’s eyes flickered for a moment; perhaps she had noticed the bouda’s odd tightness too. “Vimbo can’t talk,” said Mhumhi, looking back at the hyena, who had watched them silently. “Stop,” Kutta told him, though about what, she did not specify. She put her nose to the ground again and sniffed, going back to the threshold. Mhumhi followed her, but he was reluctant to do any tracking himself. He would rather shut his nose to the smell of Maha’s blood. Mini had stayed outside the room, sitting on the carpet by herself, but when Kutta exited she got up, wagging feebly. “We find the children,” Kutta said, without lifting her head. “Of course,” said Mini, and stopped wagging. Vimbo gave a little grunt and moved past Mhumhi to stand next to her and brush his head against her side. Kutta’s sniffing led them down the hall in the opposite direction from the stairs, and soon she came upon another patch of blood. This one seemed fresher, still damp, some beaded above the fibers. Kutta was panting again. The drops went a little ways down the hall and stopped at a pair of shiny silver doors. Kutta reared up to push at one, whining a little when it wouldn’t move, and Mhumhi went to join her, applying his own weight. The door did not budge. It did not feel like it was meant to open that way. But there were no handles on the front, just featureless gleaming metal. “Move over, Vimbo,” Mini said from behind them, and then she came over and looked at the doors critically. “I think it’s an elevator. Look.” She moved closer to the wall, head tilted far back, and then suddenly sprang upwards, claws scratching. Her nose pumped a little panel Mhumhi had not noticed before, a metal panel with two buttons in it. “Almost- had it,” Mini panted, and crouched to jump again. Vimbo stepped behind her and reared over top of her to push the bottom button with his nose. It lit with a slight light, but nothing happened. “You are unfair,” Mini said to Vimbo, as he got back down. He turned his head sideways and nudged her again. “The doors haven’t opened,” Kutta reminded them tersely. “What does?” asked Mhumhi, a little alarmed, but at that moment there came a loud ding and the metal doors slid open. Behind them was a tiny room, tinier than a bathroom, and completely empty. “A moving room,” Mhumhi muttered, exchanging his normal dubious look with Kutta, but they went in to the little space all the same. He supposed he could not be really alarmed by it after taking a ride on the trolley, but this was inside a building and it had no windows. As Vimbo stepped in last, the doors slid shut behind him. He seemed to tuck in his rump as they clicked shut. “Now what?” Kutta asked, yellow-staring at Mini. By means of response Mhumhi turned around and faced the doors again. There was another panel and buttons there, except there were many more here, rows and rows of them. Mhumhi went forward past her and pushed one of the buttons on the bottom row, one that had a smeared fingerprint of blood on it. The elevator rattled, then began to move. Kutta fell back onto all fours and stumbled sideways into Mhumhi. Vimbo gave a little grunt and seemed to brace himself. Mhumhi wondered if elevators were a common fixture of his subterranean origin. There was a definite downward movement happening around them, not side-to-side like Mhumhi would have expected from being in the trolley. It certainly have him an unsettling feeling, like he was falling, even though the floor stayed solid under his paws. The elevator came to a slow stop, which was a relief. The doors slid open. They had opened onto an odd place, with lots of metal counters and surfaces and sinks. There were also about ten painted dogs with their backs to them, though when the doors rattled they all turned around at once. For a moment nobody moved. Mhumhi was not sure who was the most surprised party. He also noticed blood on the fur of one dog’s face. With a sharp yap Mini jumped up and hit a button with her nose, her paws scrabbling and lighting more as she slid back down. Vimbo bulled forward and hit another button with his nose, a low one with triangles on it, and the doors began to slide shut just as one painted dog began moving towards them. There was a great influx of chattering and whining, and then all the painted dogs moved in, their teeth flashing, and one scraped his paw around the door for a second, but the doors closed firmly shut and they began to rise again. Mhumhi did not take heart at this. “So what do we do? Keep going up and down? They’ll catch us eventually… there’s no way out of here…” He glanced around at the close walls and began to pant. Mhumhi felt a bit of grudging respect for the little black dog; it was a well-thought out plan in such a brief time. She was a rather useful creature to have around. When the doors opened they scrambled down the hall, which was thankfully presently free of painted dogs, though they could hear paws pounding metal over from the door to the stairs. Mini led them all at a dash down the hall and around the corner. She was right- there was not one but two elevators here, side by side. They all lunged for the buttons beside the nearest one, but again it was Vimbo who hit one with his nose, looming over them. Mhumhi realized he wouldn’t even have any idea of the plan; he was just following them blindly. “Better explain it to him,” he told Mini, and she began gabbing rapidly away in hulker-speak. The pounding paws grew nearer as they watched the silver doors. Finally they opened, and everyone piled in together, and Mhumhi hurled himself at the button where the bloody fingerprint had been in the other elevator. Vimbo went for the button with the triangles again, the one that shut the door. The elevator shut, and again they went downwards. 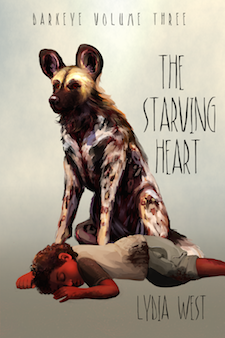 Mhumhi’s heart pounded, feeling cold air prickle at him, and he looked up. There was a vent in the ceiling. The sight of it made him very uneasy. Their smell would be escaping back upwards. They would not have so long as they had hoped. The elevator seemed to move downwards achingly slowly, magnifying the panting of everyone in the room, except Vimbo, who never seemed to pant. The elevator was filling up with their moist breath. Finally the doors opened. They were on the floor with all the metal counters again, in a different area, and this time there were no dogs. They prowled slowly between the long counters. Had they not been trying to be stealthy Mhumhi would have asked Mini what it all meant. There were long metal things hanging up, and lots of sinks, and metal grates, and buttons and dials. The floor was again tiled, making their steps painfully loud. They passed another counter with towering stacks of clean plates on top of it and saw the white flick of a tail vanishing around the corner and heard the tick-tick-tick of feeling paws. “A scout!” hissed Mini, and she said something in hulker language. At once Vimbo lunged forward, leaping heavily onto the metal counter with a crash, knocking plates everywhere, sending shattering shards flying and whizzing off the walls and floor. He vanished down the other side and there came a scream. They all dashed around the counter to see what had happened. Vimbo was standing over the body of the painted dog with his jaws around its throat. The dog was kicking still, feebly, the whites around its eyes showing. “Let her go!” cried Kutta, tucking her tail. Mini gave a little growl. “It doesn’t matter, he made enough noise to bring back the whole pack,” said Mhumhi, drawing his lips back from his teeth. The dog was still kicking, though it was now closer to being just twitching, its eyes closing as Vimbo restricted its air supply. “One less wild dog to worry about,” said Mini, and then she said something to Vimbo. The hyena thrashed his head from side to side. There was a dreadfulsnap. The painted dog had ceased to move. Vimbo dropped it on the floor. “You’ve killed it,” said Kutta, stepping backwards. Kutta did not move, only swallowed. Mhumhi felt the urge to comfort her, to move close to her, but Mini was right. They did not have time. He put his nose to the ground. He sniffed around the next set of counters, nosing past large shiny pots and pans and metal baskets. “They’re close,” he whined again. They smelled so close, that queer pale hulker smell, now lined and corrugated with blood- but fresh blood, as if it yet flowed, as if their hearts still beat. There came a thudding sound and the bang of paws hitting flexible metal. A wild dog had leaped up onto the counter in front of him and just as soon as he realized it it became a blur of dappled brown falling on top of him. It hit with teeth and rolled him over, heavier than he, well-fed. He thrust his paws out and struggled, snarling, as the other’s teeth bit into his neck. They were a frenzy of limbs and thrashing backs for a moment. Mhumhi’s jaws snapped but did not make contact, and the stranger bore him helplessly down. He could hear the sound of more paws approaching, what sounded like the whole rest of the pack and more. From one of the counters behind him and the snarling, stabbing stranger he heard Vimbo give a whoop, and Kutta shrieked. Mhumhi struggled harder. The dog’s teeth caught and cut into his cheek. There was a great loud BANG! and then the dog went limp on top of him. It took Mhumhi a moment to orient what had happened. It seemed a large pot had fallen down on the other dog’s head, and it now lay dazed over top of him. He pulled himself out from underneath it and looked up. Leaning out from one of the high counters was Tareq. “Darkeye dog!” he cried, and a large smile split his face. “A, unopened bottle of something dark and sour-smelling sat in” an unopened, and if it’s not open, how can he smell it? “Her nose pumped a little panel” bumped? “heard the tick-tick-tick of feeling paws.” feeling?